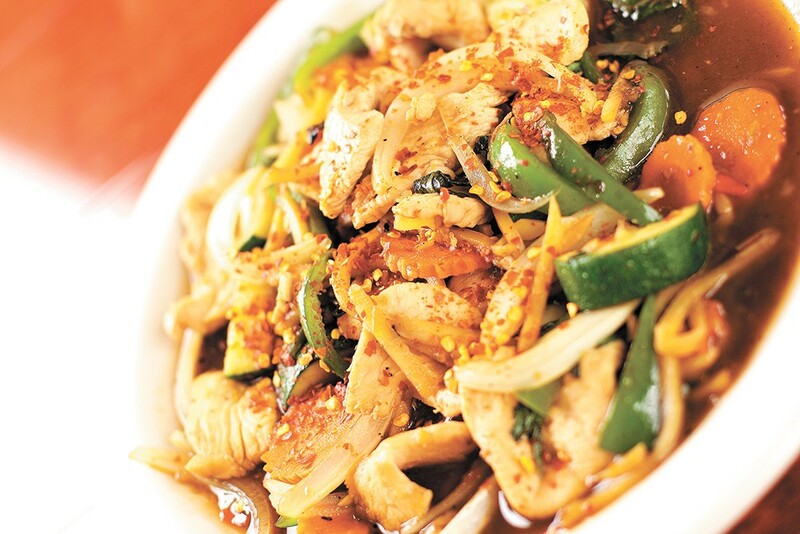 The "Spicy Old Man" (pad kra prow) is a signature dish at Sala Thai in Airway Heights. My girlfriend doesn't care much for Thai food, but she wants to go back to Sala Thai. The out-of-the-way lunch and dinner spot in Airway Heights bustles as the hostess tell us she can seat us now, but it will be about a 45-minute wait for food. It's busy tonight, but it was worth the wait. My companion suggests I order the prik king, a spicy curry dish that earns her an equally spicy look. I instead go with the Panang curry, which I'm told is the most popular curry here. The thick curry in coconut milk with veggies and your choice of meat (pork, chicken, beef or tofu) is served in a bowl with a hearty scoop of white rice on the side. The portion is not quite enough to split between two people, but enough for leftovers. I ate the whole thing. She gets the pad kee mao — another of Sala Thai's most popular dishes. Wide rice noodles, three meats, egg and veggies stir-fried together; it would undoubtedly take more than one person to finish a single portion. Little things like freshness and consistency are what makes a Thai spot stand out from the crowd. So it is with Bangkok Thai and its three Spokane locations. Crispy veggies and bright flavors are the rule, whether you're ordering something familiar like Pad Thai or something more adventurous like duck noodle soup. When Inland Northwest folks think of Thai food, a spot that often comes to mind is Thai Bamboo, the popular local chain with four locations across Spokane and Coeur d'Alene. Thai Bamboo also counts itself as one of the Inlander's Best Of Hall of Fame winners, surpassing 10 first-place titles in the annual reader's poll since owners Tom and Matavee Burgess launched the restaurant in 2001. Between the atmosphere — each location features decadent décor in the form of statues, tapestries and other art bought in Thailand by its owners; the twinkling ceiling at the flagship North Spokane location is an attraction by itself — and the expansive menu created by head chef Matavee, a native of southern Thailand, it's clear why so many locals get their fill of Thai cuisine here. Linnie's has been around for more than 25 years, so they must be doing something right at this mom-and-pop staple in downtown Spokane. The menu has all the classics covered, like Pad Thai, tom yum soup, Panang curry, and Thai fried rice, along with some more adventurous options like squid in coconut milk, and opportunities to branch out, like trying their sweet-and-sour deep-fried fish, rather than the standard sweet-and-sour chicken. However, I went with my go-to at every Thai restaurant: the heavenly massaman curry, a sweet and salty delight with coconut milk, potatoes, peanuts and onions. Linnie's did it justice, with a sweeter and lighter take than I've had in the past. My companion, also a Thai food lover, went for pad kee mao, or drunken noodles, instead of her usual Pad Thai, and enjoyed it as well. We both really liked the particular kind of spice in our dishes — Linnie's also features the 5-level spiciness scale, and our 2- and 3-level dishes both had a pleasant heat that was more at the back of the mouth (instead of the numbing, tongue-consuming, metallic heat that some restaurants go for). I love Thai food, by which I mean I love Pad Thai. Sometimes I'm so daring as to get Pad Thai with slightly different noodles. But here in the Inlander food section, we're down for adventure. So at Our Thai House, I order a whole new entrée: Panang curry with chicken. The four stars of spiciness — up from my traditional three — turns out to be a perfect match for the dish. The inherent coolness of the creamy, coconutty sauce hits you first, then the heat from the spiciness hits you a second later. That's what you want in a good sauce; multiple tastes harmonizing together. The broccoli is the downfall of a lot of dishes like these. Slightly overcooked, broccoli would become spongy and wilted. Undercooked, the crispness of the broccoli would overpower the rest of the dish. But this broccoli, swimming in the sauce along with the chicken, is perfectly cooked, teaming up perfectly with the rice, chicken and sauce.